A group of citizens have been acting to protect and enhance the green space corridor in the American Legion Parkway area of Roslindale. Thus far, the response from the community and elected leaders has been overwhelmingly positive. But to really appreciate the area’s potential, you need to see it firsthand. 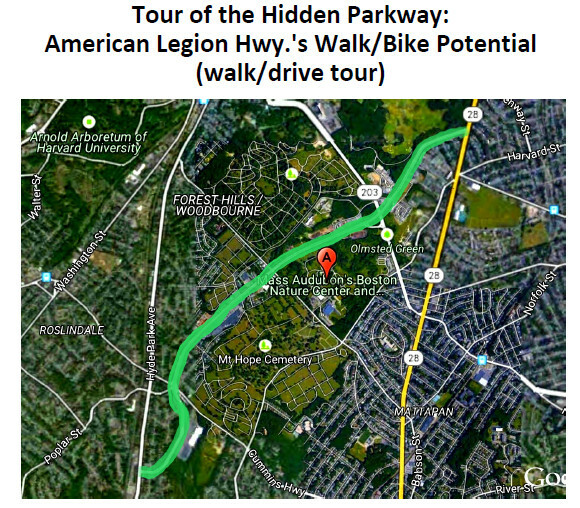 Please join us for a brisk sunny bicycle tour, tomorrow morning (Sunday, October 18) at 8am, starting at the Stop-n-Shop Plaza (Walgreen’s end) on American Legion Highway near Hyde Park Ave. Complete details in this PDF flyer; meeting point pictured below. RSVP or questions to Laura Smeaton or Lisa Beatman.